According to Fortune's Philip Elmer-DeWitt, the company from Cupertino loses its revenue from two biggest markets - European and American. 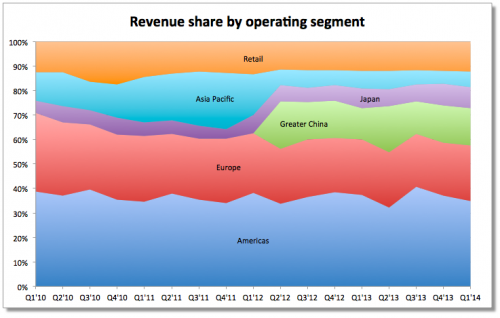 But that’s OK since the revenue Apple gets from China, Japan and Asia Pacific begins to grow rapidly. Take a look at the chart below. The bad news for Apple is that revenue from its two biggest segments -- Europe and the Americas -- have begun to contract, not just as a percentage of total revenue, but in dollar terms as well. The good news is that Japan, Asia Pacific and Greater China have so far more than taken up the slack. In Q1 2014, Apple's combined Asian sales were $17.4 billion, more than Europe ($13 billion) and closing in on the Americas ($20 billion). The reason for such growth is obvious: such products as the iPhone or iPad are extremely popular in Asia. That is why Apple has recently signed a deal with China Mobile - world’s largest carrier. This contract will surely help to boost sales in China and attract new customers. Looks like Apple has changed its priorities and now will try to please the Asian users with new products like the 5-inch iPhone or the iPad with an enormous display.